The legal cannabis industry is growing at an unprecedented pace. While estimates vary, U.S. sales in 2017 stood somewhere between $8.2 billion and $8.8 billion according to BDS Analytics. This figure is expected to surge to roughly $35 billion by 2022, GreenWave Advisors managing partner Matt Karnes told Benzinga in a recent conversation. “We expect that by 2022, all states will have implemented either a medical only or fully legal marijuana market,” he said. In this context, it's no surprise people are looking to get educated on marijuana and the business possibilities around it. Nor is it unexpected that universities are coming up with programs to satisfy this need and serve the 3.5 million high school students graduating this year. So, where can you find cannabis-focused curricula? 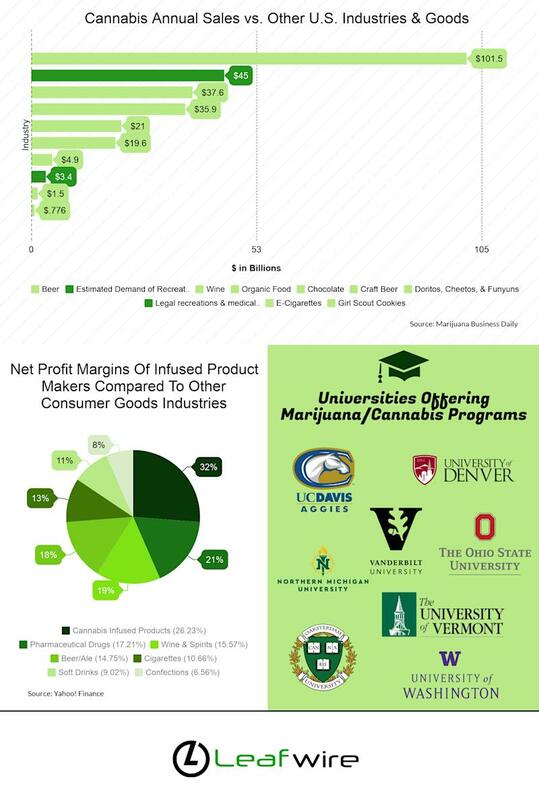 Which universities are offering marijuana programs? Northern Michigan University was the first university in the U.S. to offer a four-year undergraduate major degree in Medicinal Plant Chemistry. This program allows students to learn about the science of cannabis, preparing them for the increasing sophistication of the industry. Vanderbilt’s law school has added a Marijuana Law and Policy course to the curriculum. The Larner College of Medicine at the University of Vermont is offering an online course on “Cannabis Science and Medicine” to help address the increasing need for research-based, and relevant medical cannabis education across the country. Ohio State University’s Moritz College of Law provides a “Marijuana Law, Policy and Reform” Seminar. There are countless areas in and around the cannabis industry where future grads can aim to find employment. There are over 122,000 full-time jobs in the 29 states and Washington D.C. where cannabis is legal in some capacity. 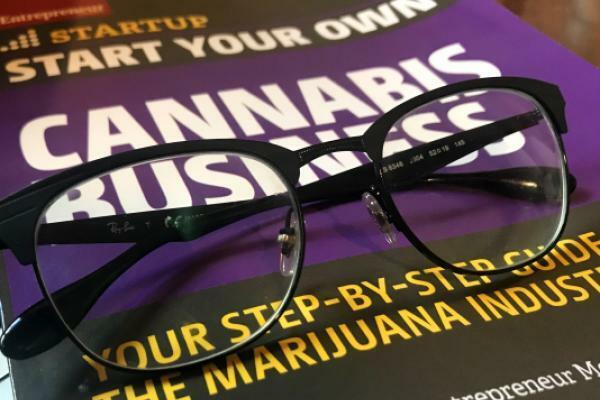 A report from New Frontier Data projects that by 2020 the legal cannabis market will create more than a quarter of a million jobs. This is more than the expected jobs from manufacturing, utilities or even government jobs, according to the Bureau of Labor Statistics. Finding the career that's right for you, combining skill with passion, still takes some careful planning and consideration. If chemistry is of interest, a student may consider a career as an extraction technician. Extraction is the art of separating the chemical compounds that make up the marijuana plant. The extraction process will result in products like wax, crumble and shatter, used for dabbing. Extraction technicians can make anywhere from $80,000 to $120,000 per year, but require working knowledge of multiple disciplines like chemistry, physics, phytobiology and chemical engineering. For all budding culinary types, becoming an edibles chef may sound appealing. With a salary range of $40,000 to $90,000 per year, many chefs consider their edible marijuana job a dream come true as it marries their love and appreciation for both cannabis and food. Most individuals who work in this field have an extensive background working in kitchens, or have pursued an education previously in the culinary arts. If business and entrepreneurialism are your passion, consider studying to become a dispensary owner or operator. While dispensary managers earn on average of $60,000 - $150,000 per year, owner/operators can earn well over $1 million annually depending on the success of the business. Consider a major in business management with focus on accounting, supply chain management and marketing. The most sought after professionals in the legal cannabis industry are grow masters. These plant prodigies are responsible for cultivating the strains of marijuana plants, which will ultimately reach consumers hands in the form of concentrates, edibles or flower. A degree in Horticulture or Botany along with work experience in greenhouses producing food or flowers will probably be required. There is a high demand for grow masters, with some salaries surpassing $100,000 per year. Whatever your interest, be it plant-touching or any of the countless ancillary businesses, there is ample opportunity awaiting young Americans who have taken the time and effort to properly educate and prepare themselves for this potentially huge economic boom.